It is almost the end of May 2016 and the weather in Baguio City shifted from sunny and warm to rainy, cold and damp. For residents of Baguio City, this is how life is in the City of Pines. This is the time when (assuming there are no typhoons), the mornings are sunny and the afternoons are rainy, and not only the kind of “drizzle and it will stop” kind of rain but rather a downpour accompanied by flashes of lightning and rumbling of the thunder. The rainy season is here, well, almost here at least, because PAGASA stated that we are in the process of transition, the shifting of weather pattern from the dry to the wet season. While some are sad that summer might be ending early, some are also happy because this is the time when the temperature in Baguio starts to cool down. We are looking forward to cold mornings, foggy afternoons and a cool evening. The cool and wet weather is the perfect time to warm your belly with a hot bowl of your favorite soup. Soup is the ultimate comfort food for this kind of weather and a piping hot bowl will definitely make you feel better. Well, that was the intention when I visited this cozy little soup shop along Leonardwood Road Baguio City. 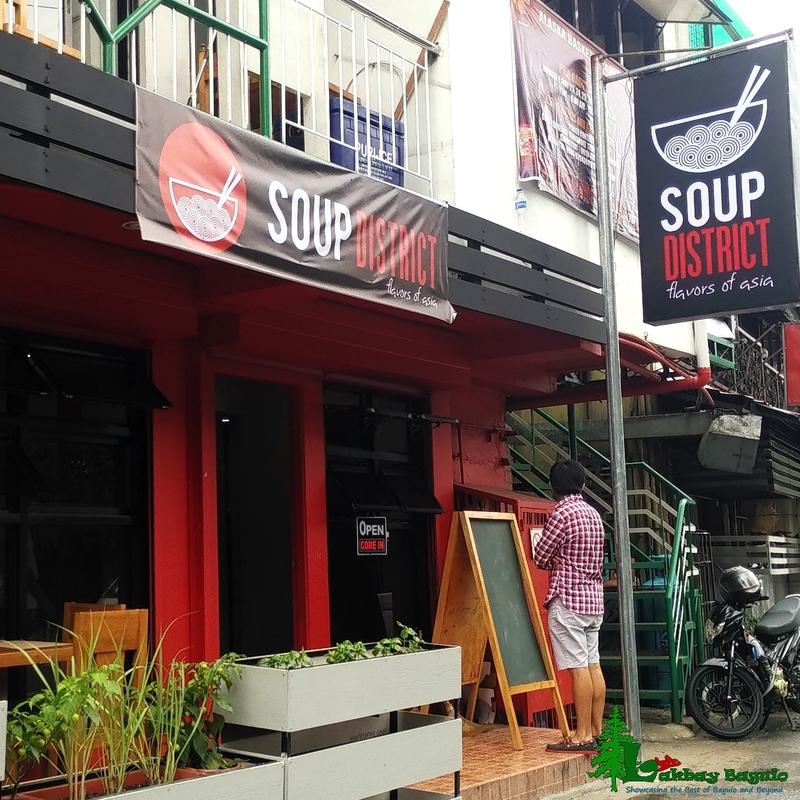 We visited the Soup district when it first opened their red door in Baguio City. There is definitely something that will attract you to this restaurant in Baguio. 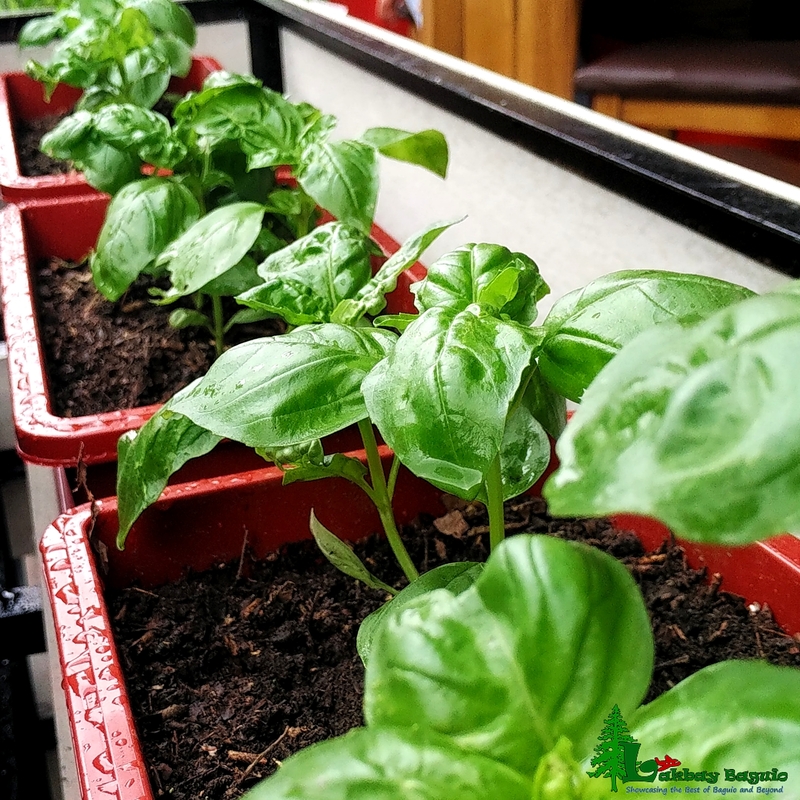 For one, the plant boxes where it is planted with herbs like basil, lemongrass, and jalapeno pepper, would definitely catch your attention. Or how about the dining tables set outside for that ‘al fresco’ dining experience. But of course, once you get inside what will definitely catch your attention apart from the simple decor, would, of course,be that piping hot bowl of soup. Spring Roll and Soup Because…Why Not? A good experience starts with simplicity, well that is what I believe at least. I am easily turned off when I see several pages with tons of food listed on the menu. The simplicity of the menu tells a lot about the restaurant, about their specialties and expertise. There are several kinds of soup on the menu and the best part about that is it is not focused on a single style of soup. 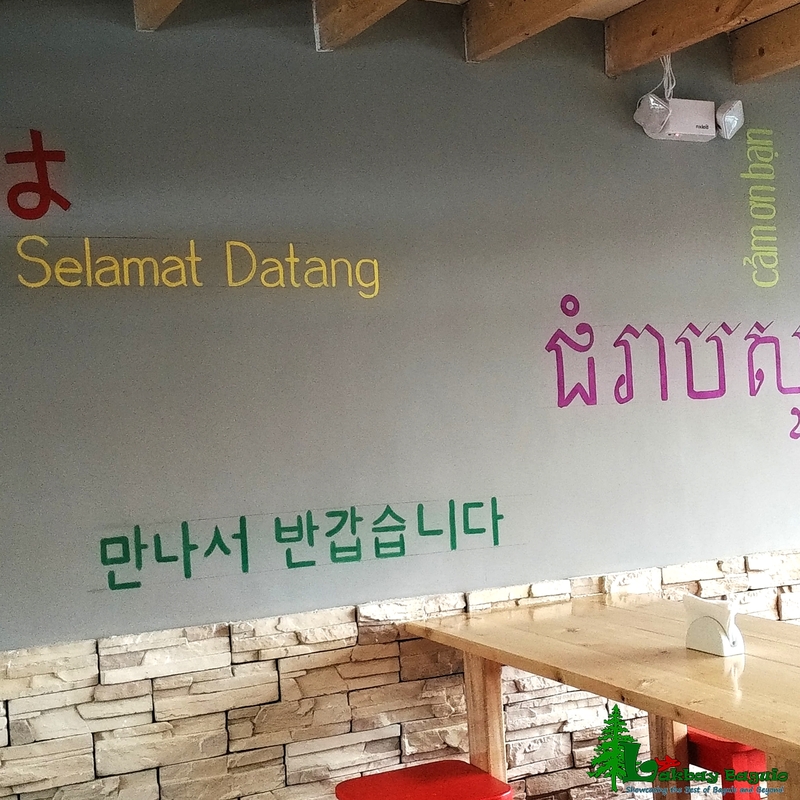 Soup district offers a tour of the different soups in Asia starting with their initial offering of the Vietnamese Pho, Tom Yum from Thailand, Ramen from Japan and Kimchi Soup from Korea. Each order is a bowl full of soup, herbs, meat/fish and noodles. Luckily, I had the chance to taste them all and here’s what I think about each of them. Pho is among my favorite soups to eat whenever I dine at an Asian restaurant.Vietnamese cuisine is, for me, one of the food that you should try and I assure you, you will enjoy it just like how Anthony Bourdain and President Obama enjoyed their meal in Vietnam. Soup Districts’ version of Pho is not far off from what I have tasted in other countries in South East Asia. 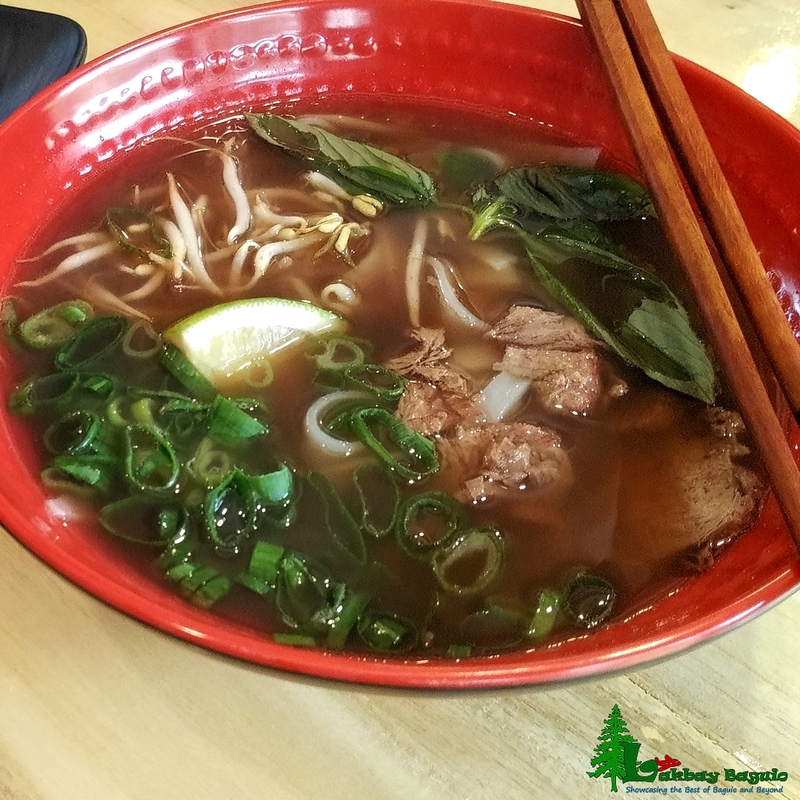 Their Pho is served with several herbs that give it that aromatic scent and flavor. If you are used to eating your Pho with lots of basil don’t be shy and ask. Every new restaurant needs to do R&D, test, and iterate in order to get the flavor that their customers want. For now, the Japanese Ramen was I believe in the research and development phase when I tried it. The noodles were too soft for me, but then again I am only one person and people have different tastes some like their noodles soft and some likes their noodles a bit chewy. Don’t get me wrong, their ramen broth though is really really good! In fact, it’s taste ranks among the best ramen I have tasted so far. Why did I say that? You can really taste the pork flavor in the broth, and according to the lovely owners of Soup District, it is a product of boiling and reducing the pork for 16 hours. 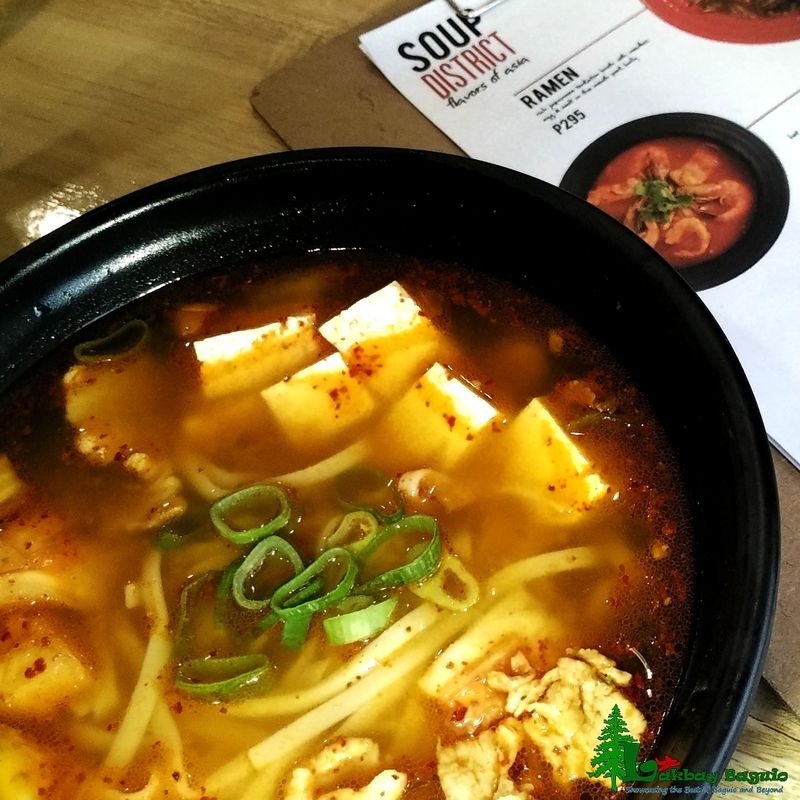 Among all the soups I have tasted at Soup District Baguio, their Korean Kimchi Soup was least of my favorite. Again, let me reiterate that it is just me and maybe my palette is not used to eating Kimchi soup. 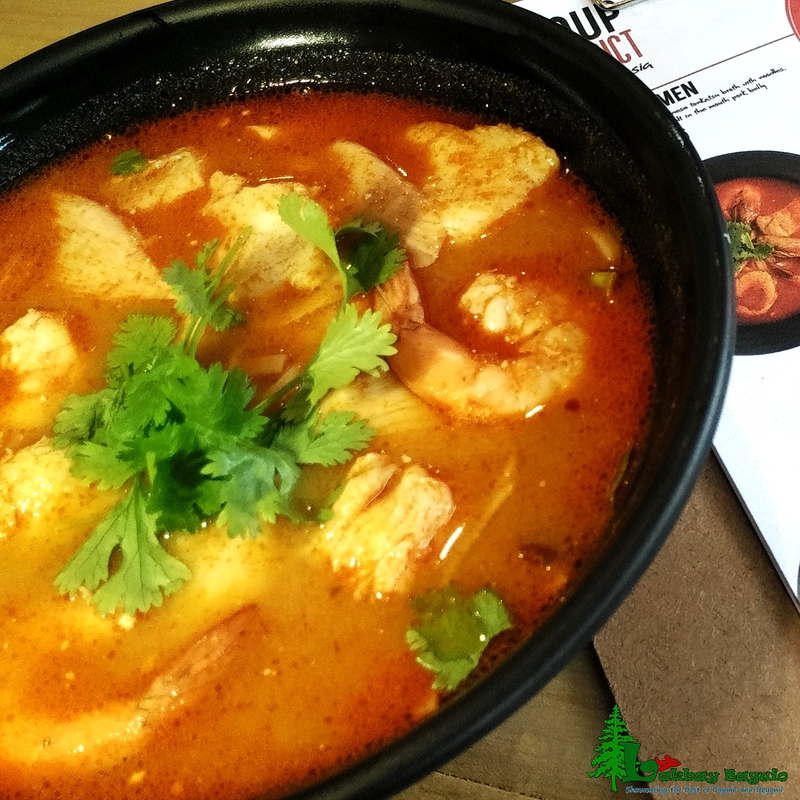 If you enjoy eating Kimchi, then you will definitely enjoy this, for me, however, it might take several visits and several bowls of Soup District’s Pho, Tom Yum and Ramen before I give it a try once more. Of course, soups are not the only thing that you can order at the Soup District. Asian dishes such as the Hainanese Chicken is also on the menu, among others. What was notable however was their desserts, we were able to try their green tea pannacotta, a soft jelly-like yet creamy dessert that combined sweetness and bitterness coming from the green tea. 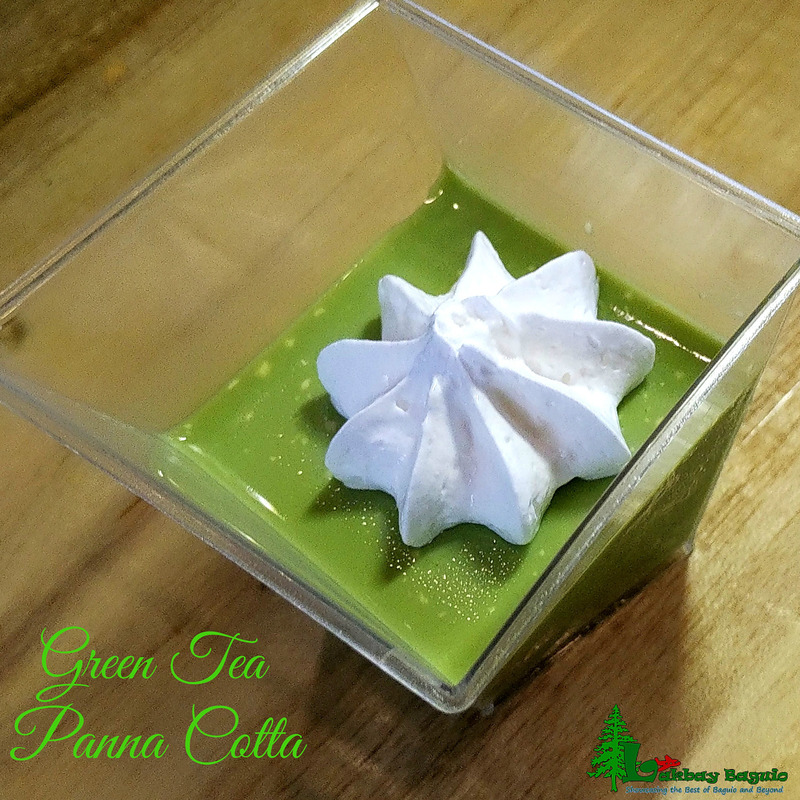 If you are a green tea lover you will definitely love the green tea pannacotta. However, if you are not into the fusion of bitterness and sweetness then the mestizaje is for you. 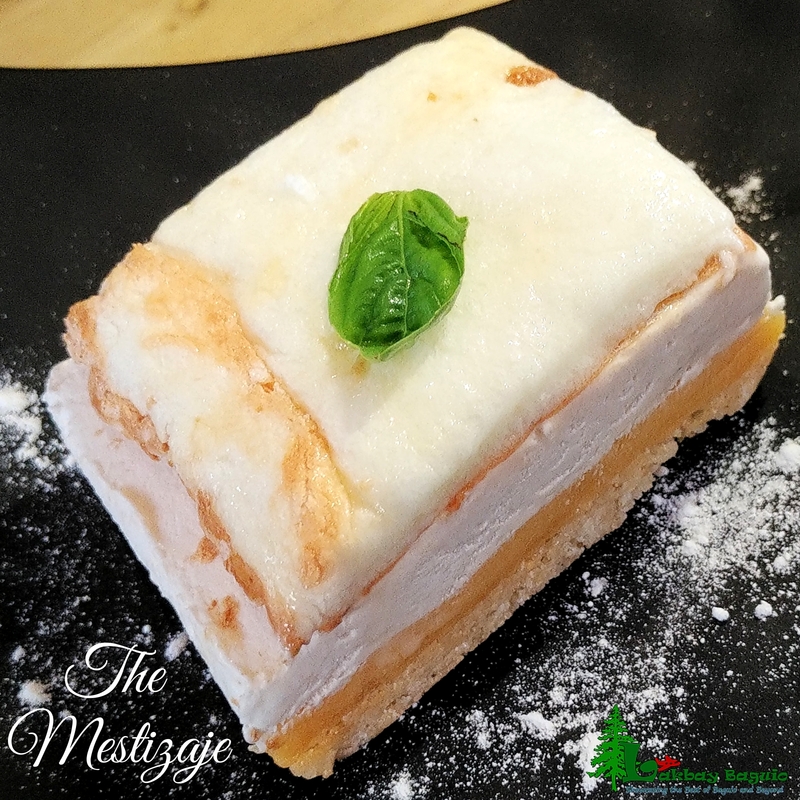 The mestizaje is made of several layers, from the soft fluffy meringue on top (similar to the Brazo de Mercedes), the ice cream center, the vanilla custard layer just below that and the crumbly nutty meringue crust. The mestizaje will take you to a journey of different textures in one bite. The desserts are not too sweet but it’s going to be a nice finish to your hot meal. For me, as a Filipino, I can’t seem to shake off that common practice of eating noodle soup paired with bread, usually with a siopao. Good thing the Soup District also serve, not siopao, but pork buns. They are kinda like mini-toasted siopao only that there is a sweet finish to it. 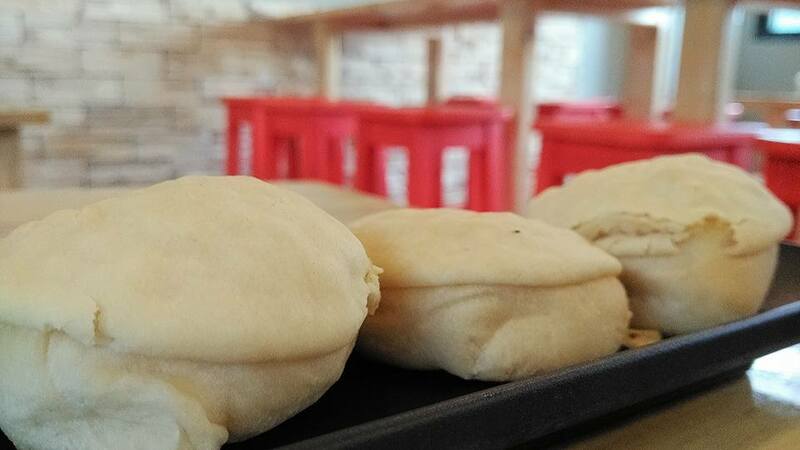 The pork buns are best eaten when hot and one bite would reveal the pork Asado filling and that light and airy bread. I appreciate the fact that you get 3 pieces on a single order of the mini pork buns. The simple design and decor, the huge windows are some things I like about the physical appearance of this restaurant. Although it is a small shop, you are able to definitely enjoy dining at this place. I like the fact that the windows are maximized in order to let natural light come in, so even on a cloudy and rainy day the place still looks bright. 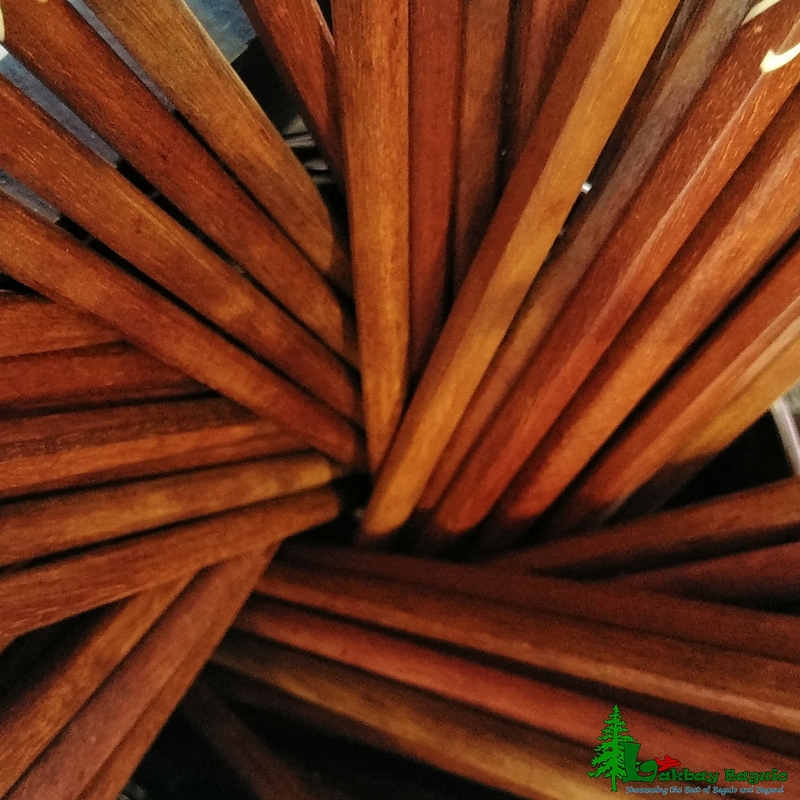 Another thing I like about the Soup district aside from their huge serving of your favorite bowl of soup, are the chopsticks, the wooden chopsticks definitely give you that authentic feel. Unless of course you want to bring your own wooden chopsticks, I guess that would be fine too. Soup Districts’ simplicity reminded me of the different Soup shops in other countries in South East Asia. From the roadside Tom Yum soup vendors of Thailand, the Pho served at the floating market in Vietnam, the pop-up Ramen shops in Japan and the street soup vendors of Korea. 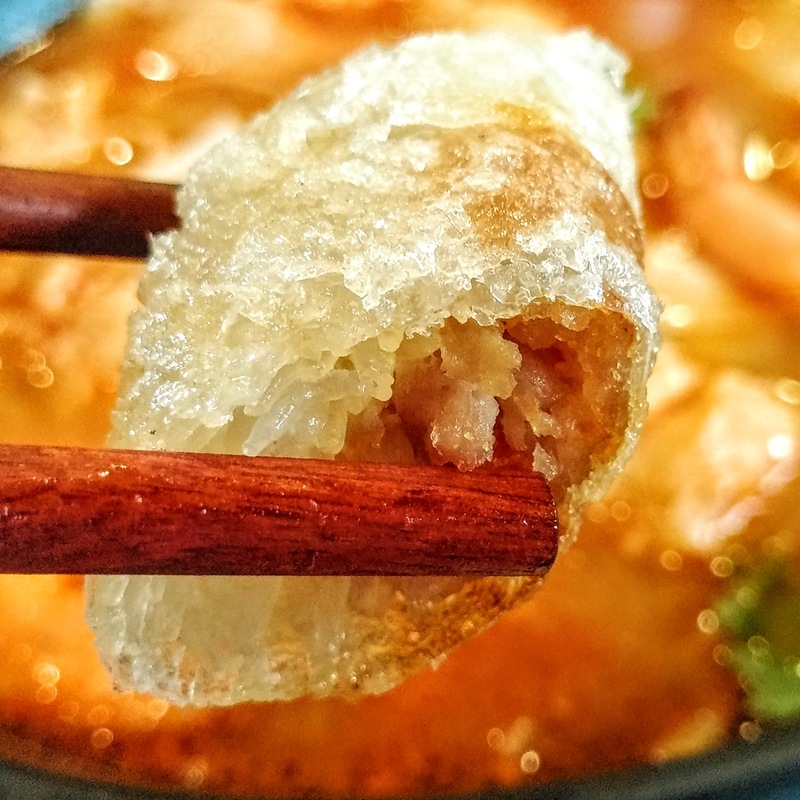 Although found in simple places like the roadside, these soups are served with passion which makes it a lot more special and what differentiates them from five-star restaurants. 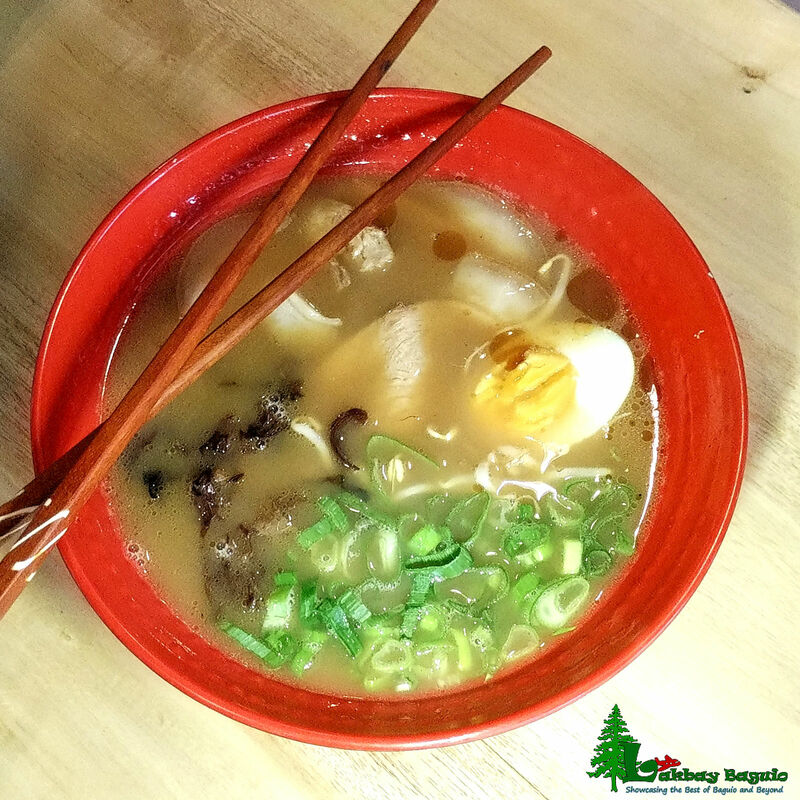 The Soup District in Baguio City was able to capture these flavors and took it to another level by giving it a Filipino twist. I would definitely go back to Soup District especially so that the cold season in Baguio City is just starting. Outside Soup District, Just look for the red door. Have you also tried the Soup District? I’d like to hear your experience! Share it via the comment section below.